ETICTAGS is a non-profit organisation helping citizens to adopt new ways of consuming, respecting human rights and environment. 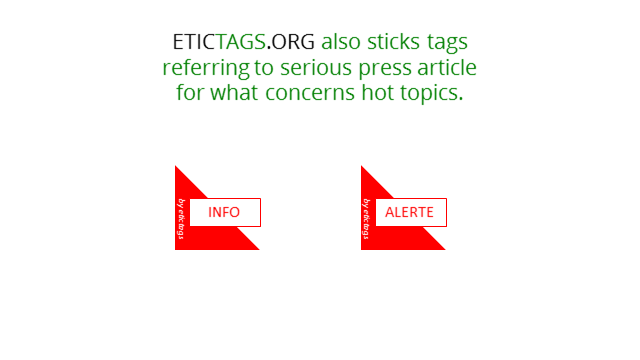 ETICTAGS highlights information from citizen organisations known for their expertise in their respective domain. 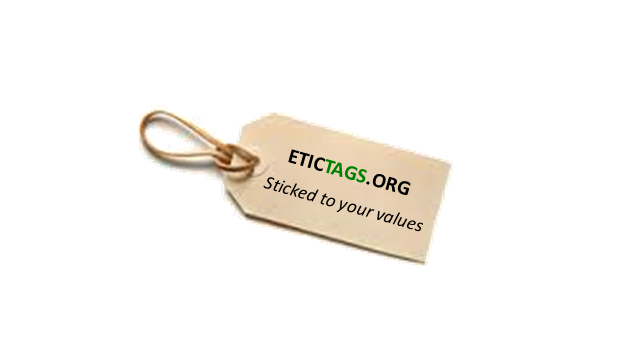 ETICTAGS is independant from any commercial interest. 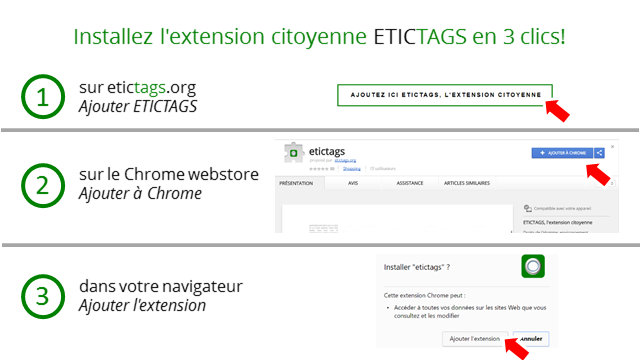 ETICTAGS proposes a simple, innovative and legal web : citizen extension. The non-profit organisation ETICTAGS does not collect any money from governments, sponsors or companies. It relies on goodwill of the team and services from partner organisations. 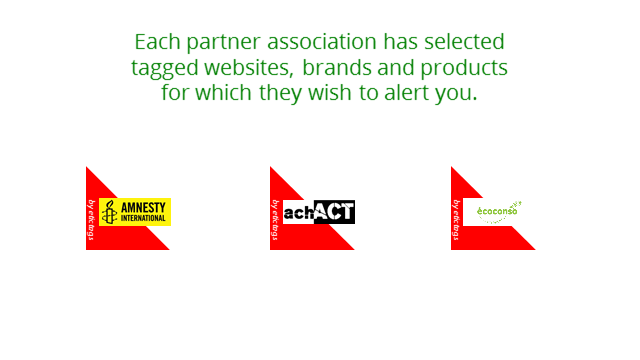 Each partner organisation selects websites to tag. Each partner organisation selects brands and products for which it is relevant to warn you. Each partner organisation is accountable of information it shows from the tag. ETICTAGS configures citizen extension to display tags on selected websites. As a user, you view the tags from all partner organisations. As a user, you can, if you wish, limit the number of partner organisations that you follow. achACT - Actions Consommateurs Travailleurs agit pour améliorer les conditions de travail et renforcer les droits de l'Homme dans les filières internationales de confection des vêtements. Elle coordonne une plate-forme de 23 organisations en Belgique francophone au sein du réseau mondial de la Clean Clothes Campaign. écoconso teases consumers to adopt consuming behaviors inline with respect of the planet and health of the citizens. Other partner organisations are planned to join soon. We are working hard to tag more sites. VOUS UTILISEZ POUR L'INSTANT FIREFOX, EDGE, INTERNET EXPLORER OU SAFARI. THANKS TO MAKE USE OF CHROME OR FIREFOX TO BENEFIT FROM ETICTAGS. We are working to make etictags compatible with other borwsers. if you want to keep informed when etictags will be available for your browser, you can subscribe with your email here below. Thanks to anti-span policy, this is the only single mail I will recieve! I WANT TO KNOW WHEN ETICTAGS WILL BE COMPATIBLE WITH MY BROWSER. This charter has NOT been written with legal slang. It's our commitment. It's a simple and readable explanation of the basic principles we apply when we collect data. The objective of this document is to be understood beyond the legal aspects. Each time you visit a "non-tagged" website, the citizen extension ETICTAGS extracts the domain name and send it to the server ETICTAGS. The extension only sends domain name (e.g. : www.example.com) and not the full URL (e.g. www.example.com/page1.html). Domain names are collected in order to guide partners, giving them access to list of most popular websites among the ETICTAGS user community. It's thus not possible to rebuild the user trajectories on a website. 2.- ETICTAGS does not rebuild user trajectories but take some aggregated measurements of collective browsing behaviors. ETICTAGS assigns a unique, transient and anonymous ID (IDAT) built from a date and a random string of characters. This IDAT is stored on your device, or linked to your browser account if you have one. When the browser starts, citizen extension ETICTAGS sends a message to the ETICTAGS server in order to count active users on a daily basis. IDAT is used to better understand user behaviour in general. For example, it is possible to differentiate 10 users viewing a tag from one user viewing 10 tags. IDAT usage is similar to famous “cookies”. EU regulation yields that cookies are renewed on an annula basis. IDAT ETICTAGS are renewed on a monthly basis in order to improve privacy protection. When a "tagged site" is visited, citizen extension analyses the address of the visited page. 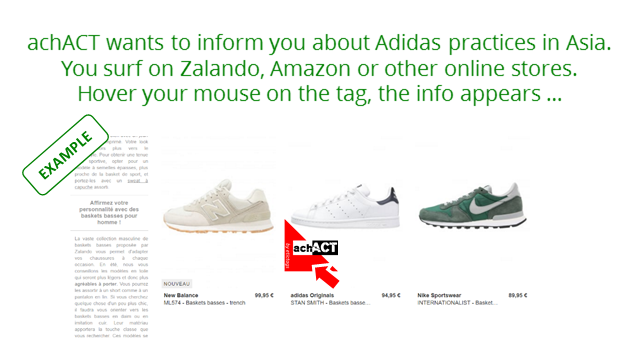 If targeted website changes, the ETICTAGS system detects the change and informs the team of the need to adapt the system. When a tag is clicked, extension detects the information. ETICTAGS system counts the number of clicks. Partner organisations can measure user interest for their tags. ETICTAGS does not have any personal data. It thus just can't share it ! Collective data are shared with partner organisations to optimize information campaigns and improve their impact. We only can improve what we measure. There is no intrusion in the visited website. Citizen extension ETICTAGS adds a tag only visible in your browser. There is no website attack or hacking of any kind. It's legal for all stakeholders, you, our partners and non-profit organisation ETICTAGS. Recover control of your browsing behaviour !